I've been constantly playing guitar for more than 25 years and having fun with musicians to have gigs from time to time at night clubs. I play blues & rock music and also sing. My favorite musicians are, Jimi Hendrix for a rock musician, Magic Sam for a bluesman, Robert Johnson for an old time blues singer, and James Blood Ulmar for a jazz guitarist. Since i've been uploading videos of my play on YouTube, i got several requests to post a tab of my play. So i make & post the tabs here for people who want to refer to. Following tabs are some instruction materials for blues learner. 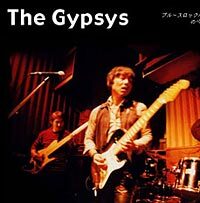 The Gypsys Home Page is open! You can also hear the band sound. Here are some sound files of my play. Guitar & vocal part of all the tunes are played by me. These are some tunes of Robert Johnson that i played and recorded in my home. I used my accoustic classical guitar for this. I multi-recorded all the tunes of the album 'Let it be', which is my most favorite one in the Beatles albums. Instead of making dead copy like many japanese beatles freaks doing (it's true, see here and click the sound marks), i re-arranged every tune one by one just for fun. Some tunes have changed to different things mostly funnier. Enjoy! You can hear all the sound files at a time here.